As the weather gets colder, you might feel like you need to hang up your horse riding gear for the winter if you haven’t got an indoor riding school nearby. Yet, with a bit of extra care, you can make riding a year-round hobby. It will also benefit your horse to keep on getting regular exercise so that they don’t get out of shape. When riding in winter, there are a few extra things to be careful of. 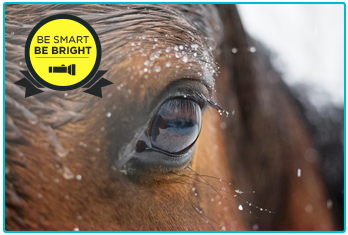 The Insurance Emporium are raising awareness of these winter hazards, including if you go hacking in the dark, as part of our Be Smart, Be Bright campaign. We’re also offering 4 weeks free on new horse insurance policies with the promo code DAZZLE17*. To help you stay safe while riding when the weather is cold and the days are short, check out our list of dos and don’ts. It can be tempting not to take your horse out as much when it’s cold outside, so their fitness levels might suffer. If you’re out in snowy conditions as well, your horse will have to work harder. With this in mind, you should adjust the amount of exercise your horse does accordingly. You will also need to take more time to make sure they are warmed up before starting, as exercising cold muscles can lead to injuries. Make sure you are wearing appropriate clothing for going riding in cooler temperatures. Wear layers that you can take off if you get too warm. Clothes made of wicking fabric are ideal if you are going to be particularly active, as they draw sweat off your body. Put ear warmers under your helmet or a hood over your helmet to stop your head getting too cold. It’s also worth wearing warmer boots, as long as you can take them out of your stirrups easily. If you are going to be riding along roadsides, put hi-vis clothing on so that drivers have a better chance of spotting you. 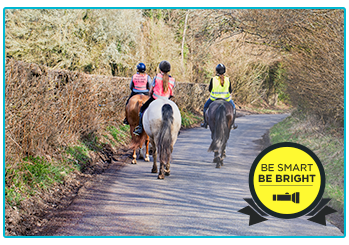 If you go hacking after dark – which it is easy to end up doing at this time of year – wear reflective gear too. Reflective clothing shines under artificial light, such as car headlights or street lights. It’s also worth considering wearing LED lights after dark, such as a band on your arm or leg or something attached to your horse’s saddle. You could also attach a red light to the back of you or your horse. Riding in the snow carries its own set of risks. If you can avoid it then do but if not, then take a few precautions with it. Snow could ball up in your horse’s cupped hooves, which will make them unstable. To avoid this problem, cover your horse’s hooves with petroleum jelly. Also, consider having your horse fitted with winter-appropriate horseshoes so that they don’t slip on the icy ground. When out and about with your steed, bring a hoofpick with you to get any snow out of their hooves. After an exercise session with your horse, you will need to spend more time cooling them off than you would have in the summer. If you leave your horse sweating then they might end up unwell. Get them to walk around for a while so that their body temperature doesn’t fall too quickly. Also, put a light blanket made of wicking fabric on their back to draw any moisture off. Once they have finished cooling off, replace their light blanket with a clean and warm one. It is well worth exercising a bit of extra caution when going horse riding during the colder months of the year. Another thing it is worth doing, for your own peace of mind, is insuring your horse. The Insurance Emporium’s Pick ‘n’ Mix Horse Insurance policies allow you to tailor cover to your needs and can include such Elective Benefits as Vet’s Fees for up to £5,000. 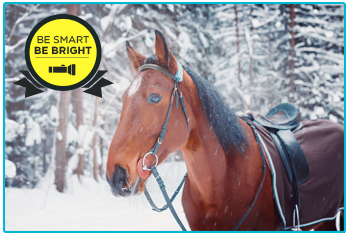 We are offering one month free on new horse insurance policies, as well as a number of our other products, as part of our Be Smart, Be Bright campaign with the promo code DAZZLE17. If you feel that this could be useful, trot over to The Insurance Emporium today!